(Note: this post is an excerpt from my book, Monuments: One Atheist’s Tour through Time, Culture, and Meaning.) As I was walking back to my car after visiting the Experimental Breeder Reactor-1 Museum, my eyes lit on two immense structures towering over one end of the parking lot. Referring back to my construction worker days, the rusting steel I-beams, tank-like structures, tangled ductwork, and electrical circuitry looked to me like chunks ripped out of an oil refinery. I saw an information display nestled between them, and walked closer to investigate. The structures turned out to be, of all things, nuclear-powered jet airplane engines! When the Second World War ended and the cold war began, military brass cast about for ways to deliver nuclear warheads over the Soviet Union. 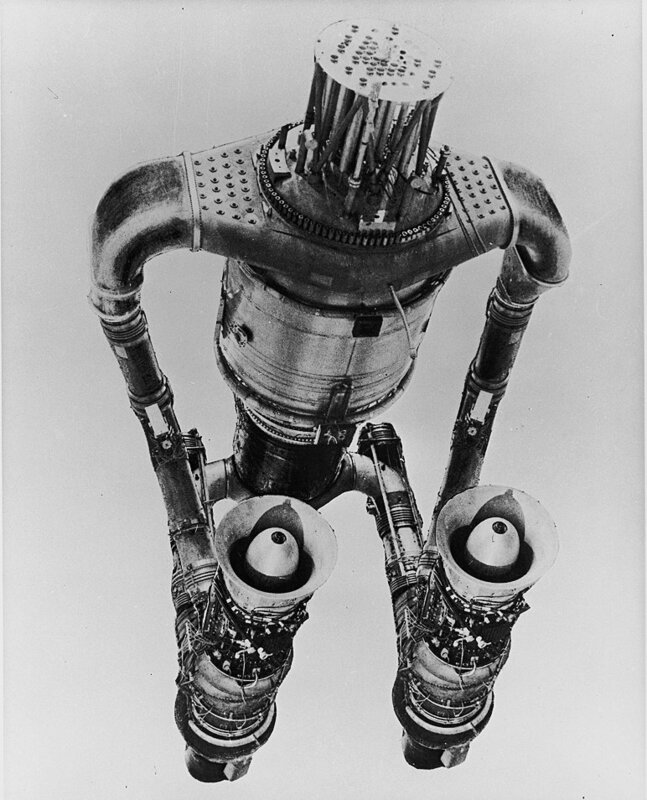 Jet engines were in their infancy, and an atom bomb weighed a good ten tons. That required a bomber of unprecedented size and speed. Hence a proposal for nuclear-powered bombers fast enough to outrun jet fighter planes and able to stay on patrol for weeks at a time. My eyebrows lifted, but there the damned things were, right in front of me. Comparing the display to the prototypes, I could even make out two old jet engines. Later reading informed me that they were J47’s, one of the first successful jet engine designs. The big tank in the middle was the reactor. They were called, “Heat Transfer Reactor Experiment” numbers 2 and 3. Scientists labored 15 years on this project. 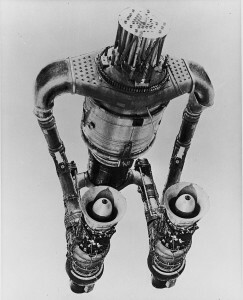 The final version, HTRE-3, used radioactive fluoride salt as fuel, housed the reaction within a beryllium oxide container, and cooled it with liquid sodium. This superheated air, which was then ducted into the jet engines. Crazy though it sounds, it got built. And they ran it for thousands of hours. The Air Force adapted a huge, B-36 bomber to accept the contraption. The B-36 was another postwar oddity, a six-engine, propeller driven bomber designed to carry those huge, first-generation nuclear bombs. By the time it was ready, jet planes made the B-36 obsolete. But it was the perfect platform for testing a nuclear jet engine. This struck me as the perfect example of how wild nuclear research got. Also what a dead end looks like and how willing we were to pour billions of dollars into such dead ends. Because while all this work was going on, other scientists were developing smaller, more efficient thermonuclear bombs. Missile technology was racing forward. By the late 1950’s nuclear powered aircraft had become superfluous, not to mention way too expensive to be practical. We spent $3 million dollars on the EBR-1 reactor. That resulted in nuclear breakthroughs all around the world. Whether I love atomic power or hate it, I can’t argue that we got our $3 million bucks worth of “bang” for that investment. We spent $15 billion dollars on the Heat Transfer Reactor Experiments. Back when a billion bucks was worth almost ten times what it is now. Then, after listening to the experts, President John F. Kennedy canceled the thing in 1961. We did learn stuff. But did we learn $15 billion 1950’s dollars worth of stuff? Musing on the tubing, steel, and rust towering above me, it was one more snappy answer I didn’t have. Outlandish though it seemed, there it was. Test reactors, an artist’s conception of the finished airplane, and of course another platoon of beaming scientists posing in front of their successful experiment. I couldn’t think of a better nutshell, into which to put the human dilemma. War and rumors of war brought energy and inventiveness unmatched by all other endeavors. Ask for a cure for alzheimer’s and we get a grant here and there, but mostly crickets. But look for a way to bomb Russia and we throw tons of billions of dollars at it. Hardly anyone complains, not least because hardly anyone knows about it. None of this nuclear energy research turned out the way we expected back in the 1950’s. Our missiles still sit in their silos even though we know it’s crazy. We now look at working nuclear power plants as Damocles’ swords. We watch our climate grow warmer every year, while all too many people pretend they don’t see green lawns in January. We spend billions of dollars to beat swords into plowshares, or beat plowshares into swords. We’ll all be generations dead and gone before anyone knows whether we bought something or just threw our money away, or even whether we wound up with a plowshare or a sword. We till fields broad beyond our vision. That’s the human condition: We are prisoners, rather than masters, of our creativity. I climbed back into my car and drove away from this strange monument on the empty desert, with its buried bodies and rusting dreams.